In my new book, Pro-Blogging Secrets, I spend a lot of time talking about some of my favorite ways to increase earnings from our blogs. This is a simple and easy tip that you can use today and see an increase in earnings. For years, I've told bloggers that if they simply start testing different variations with their Adsense units, they can increase their earnings over night. Those who took me up on it have confirmed there's a lot of money left on the table. But for those who don't ever do testing, I assume it's because it seems too difficult to figure out how to do it. Well, Adsense has finally made it very easy for us to test a lot of different variations right from the Adsense dashboard. First, log in to your Adsense account and click the "My Ads" tab. On the left side, click "Experiments." Now, hit the "Create" button to get started on your first variation. Now, you can fill out the title and details of what you want to test. I suggest testing different colors of links, display ads vs. text ads, and, possibly, fonts. 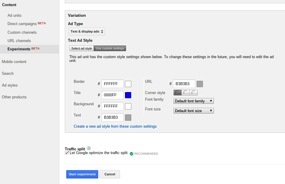 Under the "Variations" area, select an ad unit you would like to test. 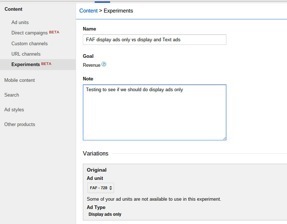 To get the quickest results I suggest testing your most popular ad unit first. In this particular test, I'm testing display ads compared to text and display ads. The original is display ads only, and for this variation, I just need to fill out how I want my text ads to appear. After that's complete, you just need to hit "Start Experiment," and Google does the rest of the work for you. Google will auto-confirm the winner after you give enough impressions. Or you can end the test at any point if you feel there's a good enough chance that one is better than the other. But the bottom line here is that changing the color of my links in my ad increased my revenue by 80 percent! The test isn't officially over yet, but since this unit has gotten almost 200K impressions, I'm comfortable we have a clear winner. So, now all I need to do is click the "Choose" next to the winner, and Adsense will automatically start showing that ad exclusively. Have you done any Adsense testing? Let us know in the comments!